If you constantly slather your baby in sunscreen, or keep a muslin over his pram throughout summer, you need to read this. It’s everything you could know about vitamin D for babies. Dr. Rangan Chatterjee, from BBC One fame, became a natural medicine advocate via a terrifying experience in which he learnt of the importance of vitamin D for babies. I recently asked my GP (who is of a holistic bent) what is the number one supplement for babies. ‘Vitamin D’ she replied, without a moment’s hesitation. Of course the importance of vitamin D for babies begins in utero. Over 76% of pregnant women are deficient in vitamin D. Taken to the extreme, prenatal deficiency can lead to rickets. This ‘Dickensian-era’ disease, which affects bone development in children, is rearing its head again. In 2009, it lead to the death of four-month-old boy, Jayden Al-Alas Wray. So how much should you and your baby take? The Vitamin D council recommends 4000-6000 iu for pregnant women. This recommendation is backed by a 2015 study published in the journal Paediatrics, which found that maternal supplementation with 6400 iu daily supplies breast-milk was adequate vitamin D for babies. For direct infant supplementation, the vitamin D council recommends 1000 iu. The more conservative Food and Nutrition board of America recommends 400 iu for infants, which is what I have been giving my son since he was six weeks old. 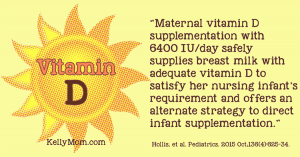 If you are breastfeeding, then your baby will be benefiting from the vitamin D you are taking. Note I say ‘taking’, not consuming, as it’s almost impossible to achieve the levels of D you need from diet alone. Sardines and egg yolks are two foods that contain vitamin D, so it won’t hurt to include both when you can (especially since they are also rich in calcium, B vitamins and omega 3s), but I would still recommend supplementing on top. In the short time I was able to give Ajax breast-milk (see my earlier post on breastfeeding), I took one tsp of cod liver oil daily. I chose to take cod liver oil rather than a straight vitamin D since it’s also rich in DHA, an omega-3 fatty acid crucial for brain development. Rosita Extra Virgin Cod Liver Oil is the brand I use since it is unrefined, unprocessed, and never heated. Several European laboratories regularly test the oils for Persistent Organic Pollutants (POPs), including pesticides (such as DDT), industrial chemicals (such as polychlorinated biphenyls, PCBs) and unintentional by-products of industrial processes (such as dioxins and furans). They have also been tested for heavy metals and microbiological contamination. One tsp provides 400-500u of vitamin D, which is perfect for baby. I have been adding it to Ajax’s formula since he was six weeks old and he doesn’t mind the taste at all. I wish I could say the same. After attempting to cover up the fishy flavour in everything from apple juice to wheatgrass shots, I ended up opting for the Rosita SoftGel capsules. If cod liver oil isn’t your thing and you’re after a pure vitamin D, you could try California Gold Nutrition Baby Vitamin D3 or Better You Vitamin D.
* In Norway, use of cod liver oil during pregnancy was associated with a 70 percent reduced risk of type 1 diabetes. * A study of over 10,000 infants in Finland conducted between 1966 and 1997 showed that supplementing 2000 iu vitamin D from cod liver oil to infants in the first year of life, virtually removed the risk of type 1 diabetes over the next thirty years. * Children born to mothers who took cod liver oil during pregnancy and lactation scored higher on intelligence tests at age four compared with children whose mothers took corn oil. During my pregnancy I soaked up the rays as much as I could, without burning. Although avoiding lying on your back (or front) on a sun lounger is no mean feat! For infants it’s another story. 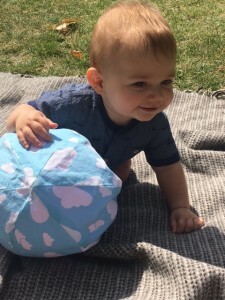 Babies skin is super sensitive; so much so that the American Academy of Pediatrics recommends that babies under six months old should stay out of the sun completely. I must admit I disobeyed this advice. From five weeks old I exposed Ajax to the Australian sun, but in very small doses and not between 11-4pm. I also didn’t use sunscreen. Instead my son wore a hat, stayed in the shade and received just a little vitamin D on his legs and toes on the short walk from home to the park. He also spent time outside in the garden in the cool of the early morning and evening. The best sunscreen for baby? Most are filled with chemicals, except this one… You can read all about it here.